The Collect was important to New Yorkers for more than just recreational purposes—it was also the city's source of freshwater for many years. That is until local industries took up residence on the shores and began to dump waste into the water. A range of tanneries, breweries, ropewalks, and slaughterhouses shared the area, and the result was that by the late 1700s the water had begun to sour and stink. 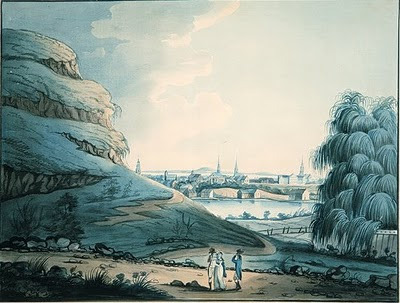 Stagnant and dirty, something needed to be done about the pond, and so in 1805 or thereabouts, the city constructed a canal intended to drain the Collect into the Hudson and East Rivers. The canal soon also began to stink, and it was eventually moved underground as a sewer. Its former path was widened to become Canal Street. When this plan didn't work as intended, city officials elected to raze bucolic Bunker Hill in 1811 and use the earth to fill in the pond to create housing for the growing population. As with any venture, marketing is important. The neighborhood that arose in this spot was named Paradise Square. Unfortunately, the land never fully settled. It was marshy, and mosquito-ridden, prone to flooding, and when buildings in the area began to sink—and the area began to smell—in the 1820s, the remaining wealthy residents fled the once desirable address. Immigrants and African Americans, seeking low cost housing as it was all they were able to afford, filled the area. 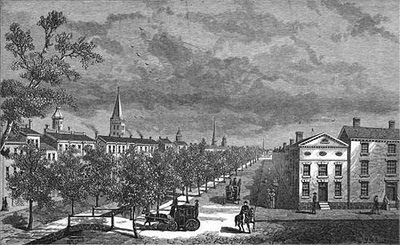 By the 1830s, the neighborhood had settled into the Five Points, sporting a reputation as a dirty and dangerous place, which would thrive into the 20th century. For more on the Five Points, click here. I see that any site knows the correct translation of collect. it's "kolk", it sounds exactly like kalck but that's english spelling haha.